Black and White School Leaver Button Badge. 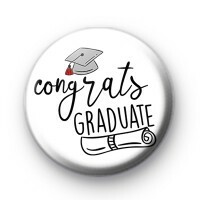 This 1-inch pin badge if for all the Graduates. If you're a teacher looking for a fun, handmade keepsake for your graduating class then our school leaver badges would be ideal. We have lots of designs for you to pick from and you're students will love them.